Wouldn’t it be awesome if you got tons of money just for having a great business idea? Picture this: the second that the inspiration strikes, the sky opens up and mounds of cash rain down upon you. I think that this must be every entrepreneur’s (ok, maybe every person’s) dream. Yesterday was the official “day one” of SeamBLiSS’s accelerator journey, and we’ve already gotten some fantastic advice. Some of what we’ve learned has been, to be completely honest, a bit overwhelming! As it turns out, having a great idea for a startup is really only half the battle. Having an idea is not gonna “make it rain” on you! 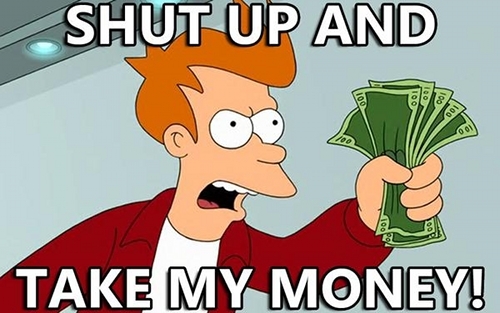 Also, Fry from Futurama is not going to hand you all of the money you need. You need to have a plan to monetize your fabulous business idea! We at SeamBLiSS are trying to work out a revenue model that will work for us, as well as our buyers and sellers. We really do want to make it afford for the consumer to obtain one-of-a-kind designer items, and we are truly passionate about giving independent designers the means to make a living doing what they love! We’re currently toying with several different models, including listing fees, sales commissions, and monthly subscriptions, and have been discussing different options with advisors and mentors. However, we think the best thing we can do is ask our customers, especially our FABULOUS beta users! As we improve our site and our services over the next few weeks, we look to build our relationship with our current designers and get their feedback. We also hope to gain some great new users for SeamBLiSS! Current and potential SeamBLiSS users – feel free to let us know what you think in the comments!